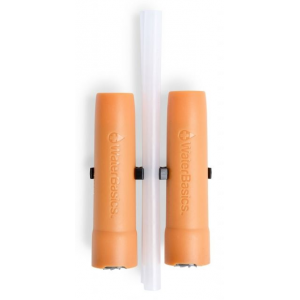 Water Basics Camp & Hike Emergency Straw Filter - 2 Pack 117860. Straw design allows you to drink from a cup bottle or directly from a water source. Includes a reusable pouch that can be filled when needed or used for storage when the filter is not in use. This straw filter features BLU Line protection - a trusty basic level of protection which is ideal for familiar water sources including municipal tap water potable water or fast moving streams and springs. Each filter includes activated coconut shell which reduces waterborne chemicals while improving the taste and odor of emergency drinking water.